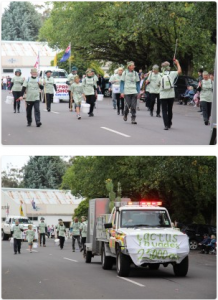 The 2013 Easter Parade where TCCG members dressed in ‘warrior’ uniforms and marched as a united army against the ‘opposition’ weed. The Tarrangower Cactus Control Group (TCCG) is entering the Maldon Easter Fair procession this year on Easter Monday, 21 April 2014. The theme will be “Pests of our Neighbourhood”. They would like to invite everyone to come along. You can come along dressed as your favourite (or least favourite) pest, e.g. rabbit, feral cat or fox. Otherwise come in your “Cactus Killing” gear. The group will meet in Hospital Street near the corner with Chapel Street North, (near the swimming pool) from 9.15 am. Entry will be judged from 10 am. They hope to see you there. It will be a bit of fun. Also the first of the 2014 TCCG Community Field Days will be on the last Sunday of this month, 27 April. These regular events focus on killing wheel cactus at a particular location. The site for the opening of the new season is a property in Watersons Road near the Tarrengower School Road corner. As usual the mornings activities will start at 10.30am.